You don’t need another bag. No really. You probably have loads. But if for some reason you do need something smaller than your standard ‘Every Day Carry’, and you want to buy something you can pass down for generations, it might be worth looking at what Tom Bihn has to offer. I’d say try to buy second hand on eBay but people barely let go of them. It’s no secret that I’m a fan of Tom Bihn’s gear. I’ve even been lucky enough for them to send me the occasional thing to review. The Tom Bihn Pilot (pictured above) is one of those things. So this arrived in the post a few of months ago and at first I thought it was too big to be useful as a shoulder bag. 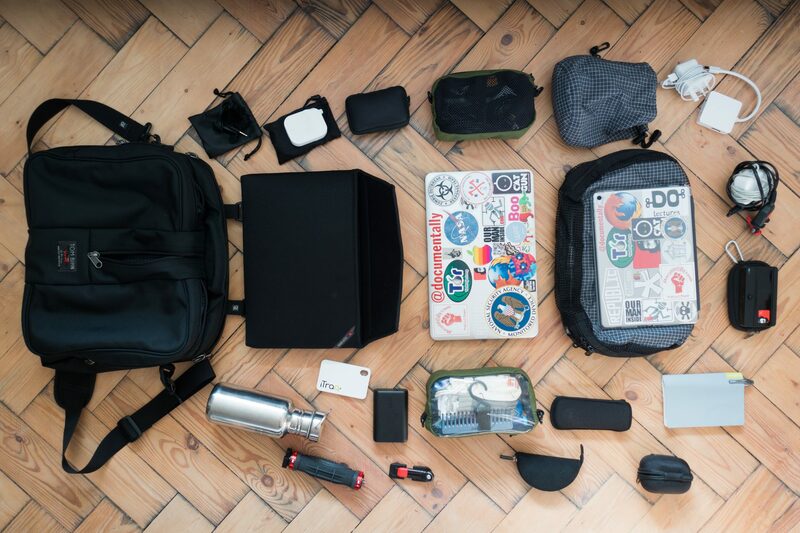 I tend to pack heavy tech and that normally requires a backpack. A bigger bag means I’ll be tempted to pack more. My EDC, should I need quick access to gear is the Tom Bihn Co-Pilot. It’s on the left in the photo below and after three years of almost continuous use it’s still like new. It carries camera, 360 gear, 11″ laptop, iPad, water bottle and everything I need on a day out working or delivering a talk or workshop. Should I be away for a night or two I used pack a backpack. But that may now change. The Azo Equipment Amhara is what I use if I need to pack more weighty gear and clothes. So back in February I loaded up the new and slightly larger Pilot with all the tech, clothes and overnight gear I’d need to work away for a night. I was pleasantly surprised. 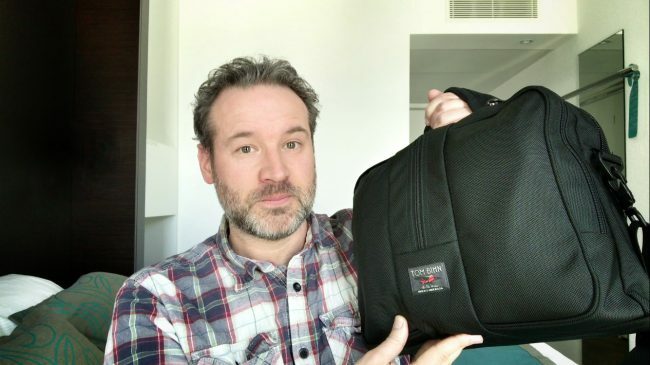 See how the laptop bag connects to the Pilot. Great for swift passage through airport security. I like to pack all the cables I’m likely to need should a venue not have them, so it’s weighty. Too weighty for a shoulder bag. So what I did was upgrade the standard strap in the photo above for the slightly springy (Absolute) strap that Tom Bihn do. This means that I can wear it over the head on my shoulder and the suspension from the strap makes a heavier bag much more comfortable. It’s so nice just placing the bag under my legs on a train, plane or in a car. Everything to hand. It’s rare to find a backpack small enough to do that although I have had my eye on the Synapse 19 for a little while. Here’s a video of me going over the bag. My kit is constantly evolving and the kit image above is already out of date but here are some of the items shown. Should you be interested. iPhone7 I opted for the smaller normal sized one as it fits all my mounts and is easier to handle. Though really not keen on how flaky it can be. 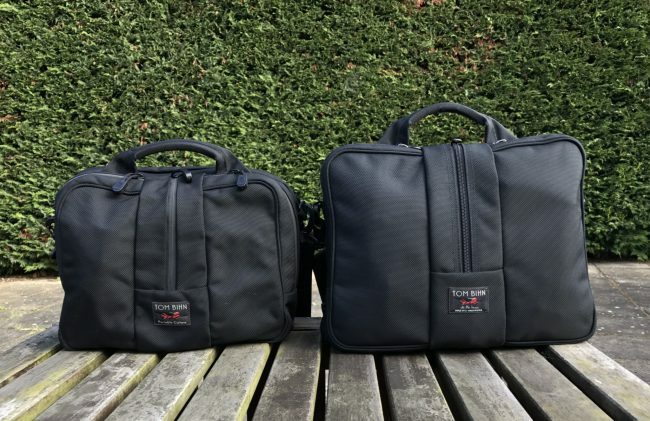 Tom Bihn 3d Mesh Bag to carry cables, slide remote etc. Anker 10000 portable battery. A good mid sized battery I know I can take on a plane with no issues. Bowers & Wilkins wired headphones I use these for monitoring and if i need to plug into my iPad or Mac Air. amazing quality. JLab bluetooth headphones I use these to podcast listening and hans free calling. Mu 2.4 amp Charger Super compact in the bag and handy for hotel rooms and trains when you want to charge two devices at once. MiFi I currently use an unlocked TP-Link MiFi. Handy for delivering data to your devices via a local sim when travelling. Or just backing up your current phone sim with an alternative to guarentee connectivity. Insta 360 Nano Handy little 360 camera. Sure MV88 Microphone A great little stereo mic for iPhone. Power Leads I’m still waiting for wireless electricity. iPhone Clamp and Handle Great for adding some ergonomics to a phone when filming. Joby Gorilla Pod Micro 250 Tiny and a vital part of my kit. Handy if you need to leave a phone or camera in place for time-lapse or video blogging. Kensington Presenter I’ve used this for years and so far it’s never let me down. Klean Kanteen Bamboo This saves me from using countless plastic water bottles. It’s paid for itself many many times over. So it looks like i’ve found my new EDC. Especially when going away for a night. Having used the Co-Pilot for so long it’s easy to like the Pilot. It’s the same. Just bigger. I know where everything goes and I know it’s going to last. Should you be looking at changing your gear shop responsibly. Buy things that last and look into how a company operates before you give them your money. I hope this has helped. If you are at MoJoCon this year say hi! I’m @Documentally on Twitter and talk train and document for a living. I mostly write on my weekly newsletter that requires sign up and is not archived online. Visit OurManInside.com should you want to subscribe.